Features possibility for 2 SME tonearms, either 9" + 9" or 9" + 12" (options). Since their introduction, AVID's award winning Diva turntables have been the benchmark for entry level turntables. With the increased popularity of vinyl reproduction, but the ever increasing costs of production, the Diva for many has become an entry level aspiration. Despite requests for lesser cost models and a product which offers the options which embodied the Diva Mk1, AVID have resisted lowering their philosophical and engineering standards to join the ranks of inexpensive rectangular plastic or wooden turntables alike many around the world. Ingenium shares the design of AVID's more expensive designs, has true engineered audiophile quality, utilises key elements of the Diva II and has an exposed minimal design that achieves new standards of style and excellence. 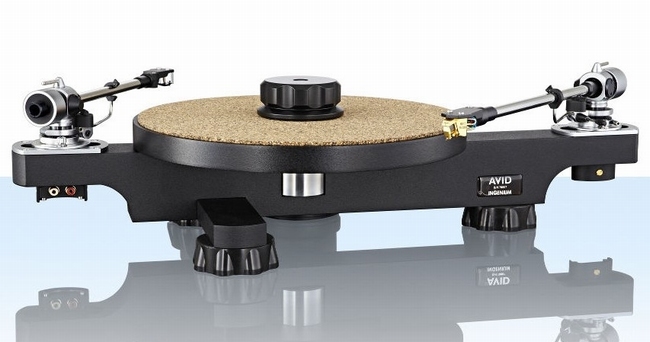 AVID's unique sapphire bearing and platter has been retained from the Diva II, with the option of using their unique clamping system, which efficiently channels unwanted vibrations away from both the record and platter. The main chassis to which the bearing and arm are rigidly coupled is machined from two and a half inch solid aluminium and allows AVID to offer different arm fitting options. In common with AVID's other designs, isolating the main chassis is critical to maintain low colouring. AVID have employed the same optimised elastomer used in the Diva II giving excellent mechanical isolation of the playing surface, resulting in better information retrieval and resolution. Using a mains powered version of the powerful motor employed in the Diva II and encapsulated within a bespoke housing to eliminate motor vibration entering the turntable, the resulting stability and the huge dynamic sound is instantly recognisable as AVID. Tonearm length 9" plus 9" 9" plus 12"